Ron Thomas ABPPAThis shows the qualification attained by Ron Thomas within the SWPP and associated societies. Ron Thomas has an Exhibition here. My photographic style: Very personable. My wedding photography is relaxed in style with the customer very much at the centre of all things. 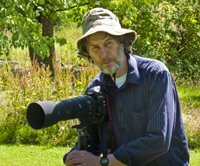 My wildlife photography firstly celebrates the NATURAL WORLD and I hope it then inspires others to learn from and to enjoy their own photography. My greatest strengths: Communication skills, problem solving, seeking out knowledge. Going more than the "extra mile" to get the picture. I have been in photography: Since childhood. The Box camera (a KODAK IMPERIAL PORTRAIT) that I first used at the age of 5 is on the desk in front of me as I write. How I got started in photography: Through a set of encyclopaedias given to me as a child. (THE WORLD OF THE CHILDREN published by Caxton). The four volumes had lots of information on lots of subjects but the pictures by Eric Hosking were truly inspirational. My photographic skills: Accomplished in photography, creativity, communication, tutoring/speaking. My personality: I tell it like it is, I could never work in the sales department! Geographic areas I cover: Merseyside, North Wales and the North West of England. Venues I frequently attend: Any type but with a bias toward small and down to earth. I found inspiration from: Obtaining knowledge. Charles Darwin. Richard Feynman. Carl Sagan. Close encounters with wildlife. Contributing to the well being of the Natural World. Success in photography: Associateship of the Royal Photographic Society. Many small competitions. Photographic training: Largely self taught. My interests outside photography: Music (acoustic guitar). Comedy. Conservation. The Natural World. Investigative reporting. Major events: I have recently become a grandfather. Little Charlotte is the most cheerful person that I know. Testimonials: I keep all of the thank you cards that my customers send to me. Why I like the SWPP: Such a great community which is generous with expertise and knowledge. Tagline: You've got me there! Future plans: Just to contribute positively to the maintenance of the planet. And finally: I am always trying new ways to see the world. I am developing battery operated CCTV equipment for wildlife observation. I have also started to use time-lapse techniques to analyse aspects of the Natural World.